With the decline of the Cold War and the traditional concerns that the period embodied, academics and policymakers began to redefine what security means – with a greater focus on the environment, degradation and scarcity as a route to conflict. Over the past 25 years a new field of research has developed, in which the interactions between the environment and conflict are examined. Within this field, a paradigmatic causal chain has emerged: that population growth, by increasing consumption and production, will cause environmental deterioration and scarcity, thus exacerbating competition and creating conflict. As Le Billon (2012: 9) states, ‘the idea that wars are associated with resources is probably as old as war itself’. Ever since Thomas Malthus wrote his ‘Essay on the Principle of Population’ in 1798, the connections between environmental problems, competition over resources and violent conflict have captured the minds of many. This appears simple: the environment is a key driver of human civilisation, and when security and resilience cannot be found, warfare is often what we turn to to achieve our aims and secure resources (Westing, 1986). Recent findings at the Neolithic massacre sites of Talheim (Germany) and Asparn and Schletz (Austria) have provided further evidence of this turn to conflict – with evidence of ancient massacres occurring as the result of completion between the first Central European farmers (Meyer et al., 2015). Within the spectre of climate change, the environmental-conflict thesis asserts that such a process will result in increased rates of conflict over scarce resources, degraded environments and the environmental refugees that will likely flee affected areas (Hsiang et al., 2013). However, this assertion possesses a number of flaws that alter its credibility and wider applicability. The neglect of the fundamental differences between violence as a consequence of environmental degradation and the economic nature of non-renewable resources as a driver of armed conflict has resulted in the conflation of struggles of different natures and involving divergent motivations. Additionally, ignorance of alternative variables provides another important limitation. Historical evidence suggests that the environment acts as just one component of a larger, complex web of causality, interacting with a number of alternative variables of both political and social composition (Salehyan, 2008). As a consequence, it will be posited in this chapter that no conflict can be exclusively environmentally driven; rather, that violence has only been environmentally induced, with ecological factors acting with a number of other factors to create a structure that allows for an escalation into conflict. First: a caveat. It is important to differentiate between the concepts of conflict and insecurity. Although the terms are regularly treated as synonymous, due to the mutually constitutive causal chain between them, conflict is an empirical phenomenon that can be observed, while the concept of insecurity is subjective and socially driven (Dabelko et al., 2000). Consequentially, it is necessary to examine cases of violent conflict within the literature rather than examples of insecurity linked to environmental degradation and scarcity. Several opponents of the thesis criticise the framing of the environment within a narrative of security, perceiving it as a means to legitimise new areas of military activity. References to security often result in the construction of popular approval for prescribed action, due to the terms’ resonation with popular desires to remain unthreatened (Dalby, 2002). Peter Haas (2002) has explored the creation of such securitised discourse surrounding environmental conflict, asserting that such practices are regularly invoked as a means to justify pre-existing state goals and do not constitute a window into state resilience. A number of authors have echoed these assertions, stating that such declarations are often made by certain interests, as a means to legitimise wider political agendas and motives (see Barnett, 2000; Verhoeven, 2011; Selby, 2014). History provides many examples of the role that the environment plays in the creation of armed conflict, fundamentally characterised as violent: from the Peloponnesian War to Alexander the Great’s empire. Westing (1986) identified 12 international conflicts over natural resources, both renewable and finite, in the period between 1914 and 1980, with examples including: World War One (the result of German desire for oil); the operational role of lebensraum in the German activity that resulted in World War Two – with similar motivations for Japanese expansionism; and the role of control over the River Jordan as a cause of the Arab-Israeli War of 1967. A territory’s possession of resources has also provided motivations for the aggressive behaviour of colonial powers when faced with independence struggles, as illustrated by the examples of Algeria (1954–62), Belgian activities in Congo (1960–64), and the Western Sahara Revolt (1976 onwards). This strategic control of resources, and the financial wealth that such control brings, has often motivated internal armed movements (Klare, 2001). The United Nations Environment Programme (UNEP) (2009) found that 40 per cent of all intra-state conflicts are linked to the appropriation or control of natural resources. Charles Taylor’s violent appropriation of timber and mineral rights, in both Liberia and Sierra Leone, was conducted as a means to finance the rebel forces of the National Patriotic Front of Liberia (Klare, 2001). Additionally, the National Union for the Total Independence of Angola’s sale of blood diamonds not only allowed for the financing of war but also resulted in the procurement of political support from the nations of Togo and Burkina Faso (Le Billion, 2001). In both cases, the presence of natural resources led to the commercialisation of armed conflict. Collier and Hoeffler (2004) found that an abundance of resources heightens the risk of violent conflict, due to this prize of control. Within this understanding it is the profit of these resources that allow the continuation of armed movements in Aceh, Indonesia; Biafra, Nigeria; and across the globe (Bannon and Collier, 2003). Such sub-national conflicts provide the thesis with its most important evidence. Importantly, a widely cited example of resource conflicts involves the presence of oil. Lujala (2010) pursued the Collier-Hoeffler findings further, finding that the presence of oil and gas reserves in arenas of violence has an important effect on the duration of conflict, with on-shore oil production often increasing the risk of potential conflict. This is symbolic of the increased entrenchment of oil within patterns of foreign policy and, with it, frequent associations between the resource and conflict. In his 1986 work, Westing pointed to a number of examples of conflicts over oil – from the 1932–35 Chaco War, between Paraguay and Bolivia; to the Paracel (His-sha) Islands clash of 1974, in which China routed Vietnamese forces to reclaim this group of islands in the South China Sea. However, these episodes were over non-renewable resources. As a consequence, such conflicts are tied not to the environment per se but rather to the economic and commercial nature of the resources themselves. This represents an important flaw in the environmental-conflict thesis: the conflation of non-renewable resources that possess a quantifiable economic value, such as oil and gas, with important ecological issues, such as degradation and climate change (Barnett, 2000). It is not the scarcity of resources that drive these conflicts, but the greed associated with their abundance. Although Saddam Hussein invaded Kuwait as a means to control the oil fields of his neighbour, he did so as a vehicle to boost Iraq’s flailing economy (Klare, 2001). As such, the conflict was not motivated by the resource but by its commercial value. If oil prices, and global demand, had been low, the conflict would have been futile and would not have occurred. The conflicts that took place in Liberia and Angola were not explicitly over control of resources but rather the affluence this would provide, enabling investment in the continuation of the war effort. Rebel groups were not fighting for the control of the resource but targetted them as a means of sponsorship (De Koning, 2008). It can be asserted that such conflicts were not environmental conflicts per se but rather traditional conflicts related to the commercial value of the environment (Libiszewski, 1992). It is society’s interactions with this ‘material’ that bestow it with an economic value, and it is this importance that drives conflicts over the resource. This hybrid socio-nature of economic resources is driven by production: the transformation of oil from fossilised organic material to the petrochemicals that are central to our lives. While nature creates these materials, it is societal reliance that converts them into conflict-worthy materials. The economic and strategic importance of oil and other non-renewable resource is indisputable. Yet the globalised character of international commerce has resulted in many nations ceasing to perceive resource dependency as a threat to autonomy or survival (Deudney, 1990). This interdependence has resulted in the decreased likelihood of inter-state conflict over control of resources, due to the price shocks these actions could propel across the system and the increasingly technological developments (Lipschutz and Holdren, 1990). Such dynamics are well illustrated by the 1973 oil crisis (Dabelko and Dabelko, 1993). Although the move by the Organisation of Arab Petroleum Exporting Countries (OAPEC) to restrict exports resulted in record price rises and the transformation of the international sphere, thus illustrating the economic relevance of resources, it did not result in international violent conflict. Furthermore, Le Billon (2001) has stated that the spectre of resource scarcity has resulted in the escalation of socioeconomic innovation and economic diversification – with the market mechanisms of contemporary capitalism creating an important impediment to conflict. In Botswana and Norway, minerals and oil, respectively, have been mobilised to ensure peaceful development rather than violent confrontation (Le Billon, 2001). Furthermore, in many cases potential scarcity has resulted in increased inter-state cooperation due to the shared interest in continued supply. The continued sanctity of the 1960 Indus Waters Treaty, between Pakistan and India, is an important example, with the spirit of cooperation over water resources enduring despite increased political tensions between the two nations (Wolf, 1998). Many have defined an ‘environmental conflict’ as one resulting from degradation caused by human activity or mismanagement, rather than the finite nature of the resources exploited (Dokken and Graeger, 1995; Benjaminsen et al., 2012). Notably, this definition will include renewable resources such as agricultural land, forests, water and fishing stocks – all of which depend on sustainable usage to ensure their continuation. The operating role of the ecological factors as a cause of conflict has been relatively neglected, with much of the academic focus being on the environment as an economic resource (WBGU, 2007). It is important to note that such conflicts predominantly occur on an intra-state basis, rather than between two nations. International conflict over environmental factors remain unlikely – whether due to the robust nature of the world trade system and dynamics of supply and demand or to the spread of small arms transforming the notion of traditional conflict (Deudney, 1990). An important example can be found in the assertions of water wars. Although the management of rivers is often complicated by their crossing of territorial boundaries and nations dependent on water from beyond their borders (Egypt, Hungary and Mauritania all rely on international watercourses for 90 per cent of their water), an international conflict exclusively over possession of and access to a shared water source is still to occur. The reasons for this are simply, as Wolf (1998: 251) states, ‘War over water seems neither strategically rational, hydrographically effective, nor economically viable.’ At the international level, the costs outweigh the benefits and cooperation is sought before conflict occurs. Environmental problems are not first felt at the international level but provide challenges to communities within the nation-state. Barnett and Adger (2007) suggested four key factors in the creation of environmental conflict: poverty, vulnerable livelihoods, migration and weak state institutions – all problems that are present at the local level. The German Advisory Council on Global Change (WBGU, 2007) found 73 examples of such sub-national ecological conflicts, primarily linked to natural disasters, between 1980 and 2005. These cases included violent regime change (1954 – Hurricane Hazel in Haiti), civil war and secession (1970 – the Bhola cyclone in East Pakistan/modern-day Bangladesh) and anarchy and looting (2005 – post-Katrina New Orleans) (WBGU, 2007). All such conflicts took place within wider causal structures. The violence in both Haiti and Bangladesh occurred due to the role that the climactic shocks took in exacerbating existing tensions (WBGU, 2007). Environmental factors often interact with the visible drivers of ethnic tensions, political marginalisation and poor governance to create a causal framework that allows degradation to affect livelihoods, interests and capital – which, in turn, lead to conflict. The contemporary occurrence of violent unrest over food and water prices provides an example of popular outbursts of dissent and violence as the result of environmental factors. During the 2008 food price crisis, 61 nations experienced some form of unrest in protest at the conditions; 38 of these were of a violent nature (Castles, 2002). Notably, all such conflicts take place on a localised, sub-national scale, with violence rarely straddling borders – illustrating the importance of contextual factors. The links between environmental stress and conflict are indirectly constructed, with a structural vulnerability necessary for the transition from poor harvests, caused by climactic factors, to food shortages and, thus, price inflation. Their occurrence is directly linked to the presence of a political vacuum in which the government either cannot provide stability and representation or is engaged in corruption and rent-seeking (Benjaminsen et al., 2012). All conflicts have particular geographies, in which a number of factors interact. Economic stability, regime type, demography, patterns of consumption, historical consciousness and power dynamics all play a role in the construction of this milieu (WBGU, 2007). Such factors affect the vulnerability of populations, institutions and ecosystems to degradation and environmental change (Evans, 2010; Gleditsch, 1998). Exposure to climatic shocks is likely to exacerbate existing societal tensions, such as poverty and exclusion, thus creating a driver for conflict in many regions (Levy, 1995). The actual risk of violence, as a consequence of environmental change, is dependent on this vulnerability (Evans, 2010). In Sudan, the Darfur conflict was the result of poverty and falling incomes, compounded by population growth and environmental pressures – ecological issues were not standalone (Benjaminsen et al., 2012). These factors are closely intertwined with those of politics and economy, resulting in a causative labyrinth – the presence of which results in assertions of exclusively environmentally driven conflicts becoming misguided and speculative. Sadly, this wider causality has been neglected in much of the research into the topic, representing an important methodological weakness (Hauge and Ellingsen, 1998). This can be seen in Selby’s (2014) review of 33 quantitative environmental conflict studies, which found no real consensus on the linkages between the environment and conflict. As Selby (2014: 834) states, ‘One study finds that low rainfall is associated with increased conflict in Sub-Saharan Africa; two others find instead that it is high rainfall that is linked to increased conflict in Africa; two studies find that high rainfall is, to the contrary, associated with reduced conflict in Africa; a further two have found that precipitation extremes, of either sign, are associated with increased African conflict; one study finds that drought has historically been associated with conflict in Europe; and five studies find no meaningful correlations between rainfall and conflict.’ This lack of consensus is driven by the neglect of important social, political, economic and cultural factors in the creation of conflict situations, and a focus on the environment as a primary cause. In these cases, it is human factors rather than the environment that lie behind societal breakdown and violence. Although the unprecedented population growth in Rwanda, coupled with traditional competition between the Hutu cultivator and Tutsi pastoralists, can be considered a primary causal factor in the 1994 genocide (Dabelko et al., 2000), causality can also be attributed to the Belgian colonial legacy that encouraged such division, alongside other structural causes of conflict (Castles, 2002). Colonial legacies have been blamed for the ecological grievances of many, with Moorehead (1992) stating that violent conflict in Mali was strongly linked to the land tenure system, a product of French colonial rule, rather than the scarcity of fertile land. Similarly, state resilience in the face of environmental problems plays a pivotal role in the onset of violence, with climate change reducing capacity to sustain the livelihoods of the population (Barnett and Adger, 2007). Hauge and Ellingsen (1998) found levels of economic development and regime type to be powerful predictors of the outbreak of conflict, with degradation acting as contributory cause rather than driver. Consequently, it has been predicted that the perils of environmental conflict are more likely to occur in less developed, poorly governed states (Smith and Vivenkananda, 2007). For example, although deforestation and the resultant soil degradation led to the collapse of the state of Haiti in the 1980s and 1990s, it was the successive repressive regimes of Port-au-Prince that exacerbated such issues by failing to ensure human security within the nation (Elliott, 1998). These competing variables also result in the absence of conflict in other states. 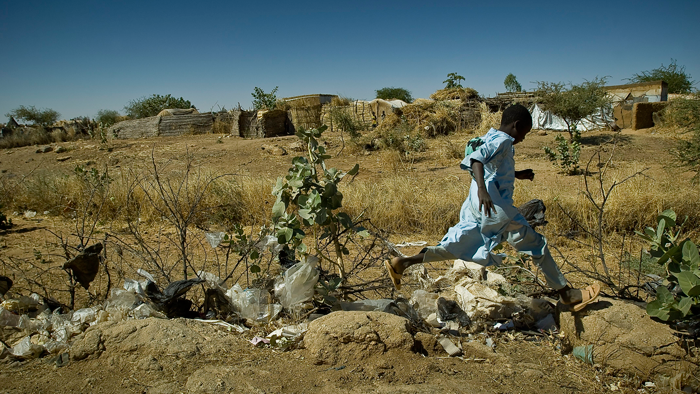 Although desertification and food insecurity were considered of causal importance in the civil war in Darfur, such factors have not led to conflicts in other states (Salehyan, 2008). Thomas Homer-Dixon (1994) explored the potential for violence at a local level as a result of environmental degradation and resource scarcity. He identified two patterns of environmentally driven conflict: elite resource capture and ecological marginalisation, triggering migration to ecological fragile areas. Importantly, these routes to conflict both involve elite and economic interests in their fulfilment (Homer-Dixon, 1994). Homer-Dixon cites the Moorish appropriation of newly fertile farmland in Mauritania, which resulted in skirmishes between the nation and Senegal, as evidence of violence stemming from elite resource capture. However, the problems that created this conflict lay beyond the events of resource capture that provided an immediate cause. Anne Guest (1995) reported that such origins can be found in the struggle to develop a Mauritanian national identity in the post-independence era, which resulted in the patronage of the Moorish majority and the political and economic exclusion of the African minority. Similar events occurred in Aceh, Indonesia, where a separatist struggle, although enveloped in a situation of resource capture, occurred in the context of national identity construction (Aspinall, 2007). It is important not only to understand these causal frameworks but also to explore the different ways that the environment is perceived and interpreted by various people, communities and nations. Much of the scholarship on the topic has failed to explore important episodes of adaptation conflict – in which nature is transformed as a means to mitigate or adapt to future climatic change. However, what one individual perceives as a route to sustainable energy and development, another perceives as the ecological transformation of a river and the displacement of local communities. Important examples of this can be found in the struggles of indigenous peoples to protect their lands. Such conflicts – primarily over forests and logging operations – are present across the world, from Brazil to Indonesia. For example, the unprecedented scale of logging operations in the Indonesian-controlled Kalimantan region of Borneo have led to intense conflicts between the native Dayak tribe and Indonesian forces (Klare, 2001). The subsequent Sampit conflict of 2001 resulted in the murder and decapitation of 100 Madurese migrants by the Dayak, before the Indonesian military restored control (BBC, 2001). However, although this conflict was triggered by state-initiated environmental degradation, the Dayak fought not for environmental reasons but for cultural and economic purposes, as the forest provided them with their livelihood and their societal base. An indigenous letter to the Indonesian authorities stated, ‘Stop destroying the forest or we will be forced to protect it. The forest is our livelihood’ (cited in Klare, 2001: 205). Indigenous action was not motivated by the intrinsic nature of the environment but by its cultural role – the destruction posing an existential threat. The importance of competing variables, forming part of a greater causal web, is well illustrated in the case of ecological migrants (Homer-Dixon, 1994). It is stated that environmental refugees place strains on their host communities, undermining the ability of local governments to provide the necessary services (Salehyan, 2008) and resulting in threats posed to collective identity and social cohesion. Aning and Atta-Asamoah (2011) found that the migration from neighbouring states into Cote d’Ivoire was a major factor in the conflict that later engulfed the nation in a cycle of violence. However, the narrow assertion that these conflicts are the direct result of migration – itself exclusively ecologically induced – is misguided. Migration is the result of both push and pull factors and the environment is only one element in a greater causal framework. The example provided by Homer-Dixon (1994) of environmental migration triggering violent conflict was that associated with Bengali migrants to the Assam region of India, which resulted in the ‘Assam Agitation’ – a popular movement against undocumented migrants. Although this movement was principally peaceful, cases of extreme violence did occur, including the massacre in 1983 of approximately 1,700 Bengalis in the village of Nellie (Homer-Dixon, 1994). However, mass migration from Bangladesh to neighbouring India was the result of a plethora of factors that pushed and pulled many towards emigration, including widespread impoverishment, ethnic divisions, patterns of private ownership, and institutional encouragement from many Indian politicians who were keen for more voters (Homer-Dixon, 1994; Lee, 2001). Therefore, such migration was not exclusively the result of ecological factors; it was also the consequence of socio-political issues and the failure of the Bangladeshi government to provide adequate livelihoods and opportunities to marginalised populations. Furthermore, the ‘Soccer War’ of July 1969, fought between El Salvador and Honduras, is regularly cited as an example of the role that migration, caused by economic and ecological marginalisation, can have in the occurrence of international conflict (Dabelko et al., 2000). Although triggered by crowd violence at an international football match, the tensions surrounding this conflict were generated by a 1962 Honduran land reform act that involved the seizure of land from Salvadoran migrants and its redistribution to native Hondurans. However, it would be reckless to place exclusive causal importance for this conflict on environmental factors, which were not standalone but acted in tandem with social, economic and legal causes. The migratory patterns that caused this legislative response were the result not of strictly ecological factors but rather the inequality of land distribution within El Salvador itself (Kapuściński, 2007). Furthermore, the resultant conflict was also predominantly motivated by socioeconomic factors. Durham (1979) found that the scarcity of land in Guatemala, frequently cited as a factor, had only limited causal importance, with the rapid expansion of commercial agriculture the cause of the ecological marginalisation of Guatemalans and Salvadorans alike. Political conflict between landowners and the campesinos created pressure on Honduran president General Lopez Arellano to protect the rights of landowners – resulting in pro-landowner land reform legislation that disproportionately affected the poor and displaced thousands of both Hondurans and migrant Salvadorans. It was this displacement of the diaspora in Honduras that provoked the strong reaction in El Salvador that ultimately led to the conflict. The Soccer War was not to do with ecology but with political and economic causality – the ecological marginalisation of campesinos, of both Honduran and Salvadoran nationality, the result of an economic contest between commercial landowner and peasant farmer. The thesis, put forward by Myers and Kent (1995), that environmental refugees cause an upsurge in internal tensions resulting in violence in their host regions is flawed. The hypothesis was based on the assumption of a direct causal linkage, utilising examples of Ethiopia, Somalia, Nigeria, Bangladesh and Sudan, among others. The deduction that Nation A suffered from environmental degradation, experienced noticeable migratory patterns, and was subjected to violence ignores the wider contextual factors that must be addressed (Castles, 2002). Such an assertion fails to understand the cultural characterisation of migration in many regions. Examples of migration in the Sahel region as the result of displacement via desertification ignores the fact that such migration has been present for centuries as a strategy of community adaptation and the continuation of livelihoods (Black, 2001). Similarly, the context of the receiving nations provides an important barrier to potential violence. For example, the Asian tsunami of 2004 resulted in unprecedented levels of population displacement and scarcity but did not trigger conflict in Southeast Asia. This is due to the presence of accommodating frameworks in the receiving nations and areas, with social integration policies being particularly important. The existence of such systems has resulted in generalised violence against refugees becoming a rare event (Onoma, 2013). The historical evidence fails to support any arguments of environmentally driven conflict and instead provides indications that the environment as an operating cause is placed within a causal framework where numerous factors intersect. Within the literature, a confused permutation of conflicts involving resources with an economic value and environmental degradation results in misguided conclusions regarding the environmental causality and nature of many conflicts. Such assumptions result in the neglect of additional variables that have created a framework in which conflict takes place. Social, political and economic factors are all important facets of the process that may eventually lead to conflict. It is these factors that have resulted in minerals in Angola and Sierra Leone leading to prolonged civil conflicts and unprecedented violence, and the same resources resulting in relative peace and growth in nations such as Botswana. The landmark academic examples of the role of such resources in the formation of conflicts neglect key variables in the occurrence of such struggles. World War Two was not caused by Adolf Hitler’s pursuit of lebensraum alone. Numerous additional factors provided an underlying interplay that resulted in the outbreak of war in 1939. This chapter has sought to illustrate that such a relationship is particularly evident in the discourse of conflict surrounding environmental migrants and refugees. The consequence of this is not the total irrelevance of environmental factors in conflict but the etymological transition from environmentally driven to environmentally induced conflicts. Ecology will always possess a role in the causality of conflict and, with the spectre of further degradation, greater scarcity and the phenomena of climate change, this role can only increase. Although the societal effects of climate change in the future are fundamentally uncertain (Salehyan, 2008), it is important for academics and policymakers to understand that ecological factors are not the sole actor in the formation of patterns of conflict. Instead, they are part of a complex web of causality, coinciding with important social, political and economic factors that can result in both the presence and absence of violence. In order to truly understand this framework, simple determinism must be rejected and a more nuanced approach developed. Lastly, a number of studies have pointed to the framing of climate change as a security issue as an important influence on events, with the perception by actors of climate as security potentially leading to more militarised responses (Salehyan 2008; Feitelson et al., 2012). With this in mind, it is important to be careful when discussing the links between the environment, resources and degradation, and conflict. Although there is an increased consciousness of environmental problems in many parts of the world, popular understanding of the complex relationships between climate change, violence and the labyrinth of other factors in the creation of conflict is still relatively inadequate. Future scholarship must transfer its focus away from conflicts over scarcity or abundance and towards issues of food and water security, livelihoods and development. It is these relationships between purely social causes of conflict and environmental factors that result in the upsurge of violence in a society responding to ecological degradation and stress. It is no longer possible to see environmental issues as neutral, detached from the social world – they must be understood as political problems with social drivers. If scholarship and policy do not explore these linkages further, the environmental conflict thesis may just become a self-fulfilling prophecy. Aning, K. and Atta-Asamoah, A. (2011). Demography, Environment and Conflict in West Africa. Accra: Kofi Annan International Peacekeeping Training Centre. Aspinall, E. (2007). The Construction of Grievance. Journal of Conflict Resolution, 51(6), 950-972. Bannon, I. and Collier, P. (eds) (2003). Natural Resources and Violent Conflict: Options and Actions. Washington, DC: The World Bank. Benjaminsen, T., Alinon, K., Buihaug, H. and Buseth, J. T. (2012). Does Climate Change Drive Land-use Conflicts in the Sahel? Journal of Peace Research, 49(1), 97-111. Barnett, J. (2000). Destabilising the Environment-Conflict Thesis. Review of International Studies, 26(2), 271-288. Barnett, J. and Adger, A. (2007). Climate Change, Human Security and Violent Conflict. Political Geography, 26(6), 629-655. BBC (2001, February 27). Horrors of Borneo Massacre Emerge. Black, R. (2001). Environmental Refugees: Myth or Reality. Journal of Humanitarian Assistance. Working Paper No. 34. Geneva: UNHCR. Castles, S. (2002). Environmental Change and Forced Migration: Making Sense of the Debate. UNHCR: Issues in Refugee Research, Working Paper No. 70. Geneva: UNHCR. Collier, P. and Hoeffler, A. (2004) Greed and Grievance in Civil War. Oxford Economic Papers, 56(4), 563-595. De Koning, R. (2008). Resource-Conflict Links in Sierra Leone and the Democratic Republic of Congo. Stockholm: Stockholm International Peace Research Institute. Dabelko, G. D. and Dabelko, D. D. (1993). Environmental Security: Issues of Conflict and Redefinition. Harrison Programme on the Future Global Agenda, Occasional Paper No.1. College Park, MD: University of Maryland. Dabelko, G., Long, S. and Matthew, R. (2000). State-of-the-Art Review of Environment, Security and Development Cooperation. OECD Working Paper. Dalby, S. (2002). Environmental Security. Minneapolis: University of Minnesota Press. Deudney, D. (1990). The Case Against Linking Environmental Degradation and National Security. Millennium: Journal of International Studies, 19(3), 461-476. Dokken, K. and Graeger, N. (1995). The Concept of Environmental Security – Political Slogan or Analytical Tool? PRIO Report, No. 2. Oslo: International Peace Research Institute. Durham, W. H. (1979). Scarcity and Survival in Central America: Ecological Origins of the Soccer War. Stanford: Stanford University Press. Elliott, L. (1998). The Global Politics of the Environment. London: Macmillan. Evans, A. (2010). . Washington, DC: World Bank. Feitelson, E., Tamimi, A. and Rosenthal, G. (2012). Climate Change and Security in the Israeli-Palestinian Context. Journal of Peace Research, 49(1), 241-257. German Advisory Council on Global Change (WBGU) (2007). Climate Change as a Security Risk. Berlin: Earthscan. Gleditsch, N. P. (1998). Armed Conflict and the Environment: A Critique of the Literature. Journal of Peace Research, 35(3), 381-400. Guest, A. (1995). Conflict and Cooperation in a Context of Change: A Case Study of the Senegal River Basin. In: J. MacMillan and A. Linklater (eds). Boundaries in Question: New Directions in International Relations. London: Pinter. Haas, P. M. (2002). Constructing Environmental Scarcity. Global Environmental Politics, 2(1), 1-11. Hauge, W. and Ellingsen, R. (1998). Beyond Environmental Scarcity: Causal Pathways to Conflict. Journal of Peace Research, 35(3), 227-243. Homer-Dixon, T. F. (1994). Environmental Scarcities and Violent Conflicts: Evidence from Cases. International Security, 19(1), 5-40. Hsiang, S. M., Burke, M. and Miguel, E. (2013). Quantifying the Influence of Climate on Human Conflict. Science, 341 (6151). Kapuściński, R. (2007). The Soccer War. London: Granta Books. Klare, M. T. (2001). Resource Wars: The New Landscape of Global Conflict. New York: Henry Holt & Company. Le Billon, P. (2001). The Political Ecology of War: Natural Resources and Armed Conflicts. Political Geography, 20(5), 561-583. Le Billon, P. (2012). Wars of Plunder: Conflict, Profits and the Politics of Resources. London: Hurst & Co.
Lee, S.-W. (2001). Environment Matters: Conflict, Refugees and International Relations. Seoul and Tokyo: World Human Development Institute Press. Libiszewski, S. (1992). What is an Environmental Conflict? ENCOP Occasional Paper No. 1. Berne: Swiss Peace Foundation. Lipschutz R. and Holdren, J. (1990). Crossing Borders: Resource Flows, the Global Environment and International Stability. Bulletin of Peace Proposals, 21(2), 121-133. Lujala, P. (2010). The Spoils of Nature: Armed Civil Conflict and Rebel Access to Natural Resources. Journal of Peace Research, 47(1), 15-28. Meyer, L., Lohr, C., Gronenborn, D. and Alt, K. W. (2015). The Massacre Mass Grave of Schöneck-Kilianstädten Reveals New Insights into Collective Violence in Early Neolithic Central Europe. Proceedings of the National Academy of Sciences, 112(36), 11217-11222. Moorehead, R. (1992). Land Tenure and Environmental Conflict: The Case of the Inland Niger Delta. In: J. Käkönen (ed.). Perspectives on Environmental Conflict and International Relations (pp. 96-115). London: Pinter. Myers, N. and Kent, J. (1995). Environmental Exodus: An Emergent Crisis in the Global Arena. Washington, DC: The Climate Institute. Onoma, A. K. (2013). Anti-Refugee Violence and African Politics. Cambridge: Cambridge University Press. Selby, J. (2014). Positivist Climate Conflict Research: A Critique. Geopolitics, 19(4), 829-856. Salehyan, I. (2008). From Climate Change to Conflict? No Consensus Yet. Journal of Peace Research, 45(3), 315-326. Smith, D. and Vivenkananda, J. (2007). A Climate of Conflict: The Links between Climate Change, Peace and War. London: International Alert. UNEP (2009). From Conflict to Peacebuilding: The Role of Natural Resources and the Environment. Nairobi: United Nations Environment Programme. Verhoeven, H. (2011). Climate Change, Conflict and Development in Sudan: Global Neo-Malthusian Narratives and Local Power Struggles. Development and Change, 42(3), 679–707. Westing, A. J. (ed.) (1986). Global Resources and International Conflict: Environmental Factors in Strategic Policy and Action. Oxford: Oxford University Press. Wolf, A. T. (1998). Conflict and Cooperation along International Waterways. Water Policy, 1(2), 251-265. Ed Atkins is a PhD Candidate in Energy, Environment & Resilience at the University of Bristol. His doctoral research is focused on the competing perceptions of the environment and, in particular, water and how such understandings interact and compete within discourse – utilising the case study of dam construction in contemporary Brazil. This is with a particular focus on the discourses used to deflect opposition to important schemes of reform and infrastructure construction. His wider research interests include the narratives of climate change, environmental conflict and the Anthropocene. You can follow him on Twitter at @edatkins_.